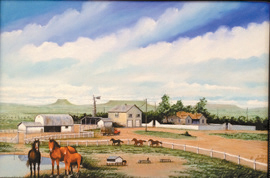 “Metcalfe Museum and Art Gallery are pleased to present the paintings and sculptures of Gary Leddy of Leedy, Oklahoma. His magnificent work will be available for viewing until May 31, 2017. Gary developed his interest in art form his childhood environment.